In heart failure cardiology, Patrick Campbell found the perfect combination of science and the art of medicine. 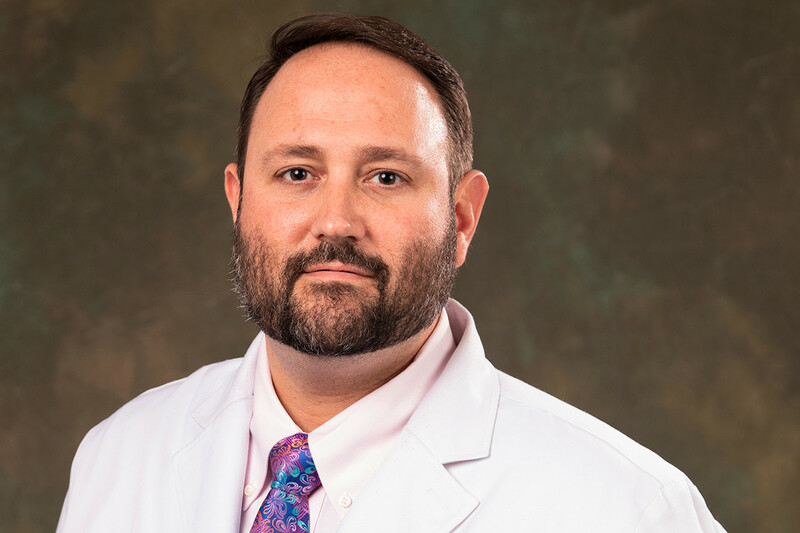 As Director of Clinical Research for the Baptist Heart Failure and Transplant Institute, Campbell is involved in research dedicated to improving heart failure therapies. He also works with fellows and colleagues to publish research/review articles, write book chapters and speak at national meetings. As the only comprehensive heart failure and transplant program in the state, Baptist Health and Transplant Institute provides the most advanced and cutting edge therapies for heart failure. Campbell and colleagues provide care that includes cardiac transplantation, left ventricular assist devices (LVAD), extracorporeal membranous oxygenation (ECMO), Impella (temporary LVAD) and inotrope infusions. The institute has added a pulmonary hypertension clinic and cardiac amyloidosis clinic. A native of Canada, Campbell always had an interest in biology and science in general and said his interest in medicine may have been influenced by visits to a respected family physician. He was also influenced by a standout cardiology fellow while he was in medical school, but Campbell didn’t really embrace heart failure cardiology until his intern year. Campbell values the fact-based routines of science, but the art of medicine drives a need to adapt and adjust frequently to heart failure patients and their response to medical therapies. That means research and trials. Led surgically by John Ransom, The Baptist Health Heart Transplant Program was in the top 5 enrolling institutions in the U.S. for the Momentum 3 clinical trial. The trial led to FDA approval for the latest generation left ventricular device for the treatment of end-stage heart failure. “I am privileged to have a career that offers new, exciting challenges and opportunities to care for patients, learn, educate and expand my clinical practice on a regular basis,” Campbell said. One of Campbell’s favorite memories is of a 28-year-old woman who developed severe heart failure symptoms after delivering her baby. A number of treatments and procedures ultimately led to the team installing an LVAD. The woman improved over two weeks and after a month she returned to the clinic, walking in with her baby girl. “It reminds me of how fortunate we are at our program to be able to offer state-of-the-art care that keeps families together,” Campbell said.